A People Magazine "Get Set for Summer Pick"
Blessed with beauty, talent, and a loving family, the Aschers seem to have it all. Joe and Laura are the toast of New York--a wildly successful playwright and a wealthy, well-educated actress. Then one winter night, seventeen-year-old Thomas dies, and the Aschers lose everything. More than a decade later, as their daughter Emily's wedding approaches, the family yearns to reconnect. But in order to do so, Joe, Laura, and Emily will first have to confront the tangle of blame, guilt, and long-held secrets that tore them apart. Shifting between past and present over the course of sixteen years, The Embers is an utterly gripping and exquisitely tender story of a family struggling to reconcile the past and embrace the future. Hyatt Bass wrote, directed, and produced the film 75 Degrees in July, which was released in 2006. She is the author of the novel The Embers. “First novels shine too. 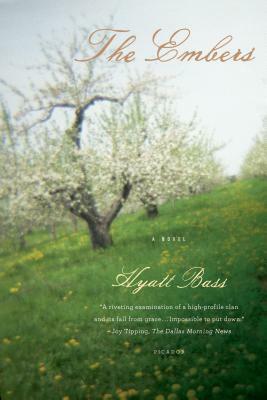 In filmmaker Hyatt Bass's The Embers, newly engaged Emily and her parents finally begin coping with the death of Emily's brother.” —Barbara Hoffert, The Phoenix, "The Best in Summer Reading"
Did anyone do anything "wrong" during the therapy session with Dr. Shepherd, or was the impasse between Emily and Joe simply already too great? What did Joe really mean when he blurted out, "I didn’t do anything"?